Hiding in plain sight in the American psyche is the concept of The Road. The Great American Highway is not just a tool to get from place to another. It’s an indelible symbol of the freedom to move, the sense of adventure, the anticipation of “what’s next” that all Americans share. I’ve had a good bit of time to think about The Road lately as we have just returned from a driving trip to the western U.S. — a trip that put us on the Great American Highway for about 3,700 miles over the last ten or eleven days. Our journey took us alone the fame Route 66, the Mother Road, and many other places. You’ll be hearing more about that in days to come. Meanwhile, our road trip is my excuse for a somewhat abbreviated newsletter this week. I hope you’ve had a great week and are looking forward to a great weekend. If you’re like me, you’re a bit of a sucker for “top 10” or “10 best” lists — especially when it comes to books about topics that interest me. So here’s a good one. Crime novelist Ron Reynolds has written an intelligent and entertaining piece for The Guardian on his top 10 books about gangsters. 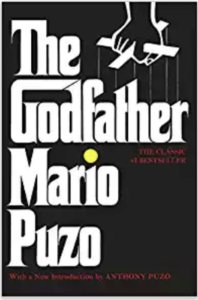 He begins, of course, with The Godfather, a book I read many years ago and a movie I’ve seen enough to have most of the lines memorized (much to the irritation of my wife). This is a good list and a good, short read. Artist John Trumbull had been in London only a short time in 1780 when he started working on a full-length portrait Great Britain’s arch American enemy George Washington. Trumbull, a former colonel in the Continental Army, was clearly violating the pledge he made to British officials not to participate in political activities. Ostensibly, he was in London simply to study art. But Trumbull’s portrait of Washington had a direct political message: The leader of the American Revolution was a tall, handsome, confident man of honor (very important in the 18th century) who was set on defeating the mighty British Army. That message would fall on willing ears, not only in some circles in London but also on the European continent — especially in France — where the British were despised. 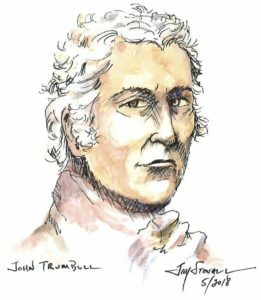 Once Trumbull had completed his portrait — a strikingly bright, detailed likeness of the general — he gave it to a sympathetic London printer who made hundreds of copies. Before long, people all over Europe had their first glimpse of this American soldier, and they were impressed. Washington’s picture started turning up everywhere: books, magazines, and even as part of a wallpaper design. But while many in Europe were impressed, many in London were aghast. At this time, Londoners had gotten word on the betrayal of the Continental Army by Benedict Arnold, and that was good news. The bad news was that a British officer, John André, who had helped Arnold had been captured behind American lines. André was tried by a military tribunal, found guilty of being a spy, and hanged. That the Americans should commit such an act was shocking, even though the British had hanged Nathan Hale with much less due process. 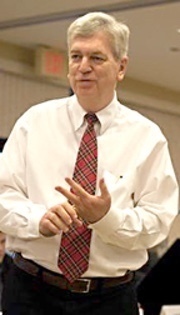 As a partial act of retaliation, Trumbull was arrested and accused of spying. Unlike with André, Trumbull had not be caught doing anything, and the hard evidence against him was thin at best. 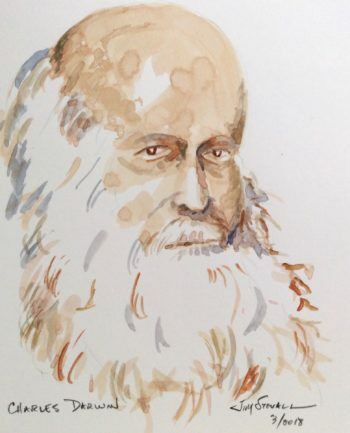 He spent seven months, mostly in a comfortable prison room where he could move about and entertain visitors. His mentor Benjamin West, the American who ran the studio where Trumbull was learning his art, appealed for his release directly to George III, as did other political influential men. Eventually, he was released, and he left London for Amsterdam and from there back to America. Source: Paul Staiti. Of Arms and Artists: The American Revolution through Painters’ Eyes. See also a previous post on another Revolutionary War artist Charles Willson Peale. 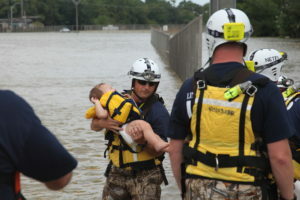 OntheMedia, the radio show about all things journalism, has produced an excellent piece to counter some of the predictable narrative that you are likely to hear as we approach another season in which high winds and waves slam into various parts of the U.S.
Members of FEMA’s Urban Search and Rescue Nebraska Task Force One (NE-TF1) remove an infant from a rescue boat in the aftermath of Hurricane Harvey. News consumers should always be wary of what they see and hear. They should understand that recurring news stories inevitably gain a narrative that journalists are expected to follow. Often, that narrative has flaws — flaws that can impede the truth. This piece helps us understand some of the flaws of “natural disaster” coverage. Independence Day Celebration — Books about Freedom. 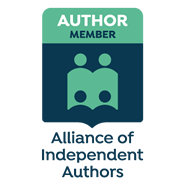 This Instafreebie group giveaway has some fantastic books by an excellent group of independent authors (including . . . ahem . . . me). You will find something to add to your summer reading stack. This is my weekly reminder to all of us (especially me) that there are many people who need our help. It’s not complicated. Things happen to people, and we should be ready to do all the good we can in all of the ways we can. (Some will recognize that I am paraphrasing John Wesley here). When is the last time you gave to your favorite charity? The United Methodist Committee on Relief (UMCOR.org)is my favorite charity. Please make a contribution to yours.